Analysis Flash memory biz Fusion-io's latest results show ever-deepening losses, with management talking of OEM channel conflict to be sorted out. Can this once high-flying server flash supplier take off and fly again? When low-hanging fruit pickers come down to Earth they rarely fly so high again. Look at sTec, OCZ and Nexsan. Their original business model is ill-suited to the changed circumstances back at ground-level and significant changes are needed; which brings us to Fusion-io and the server PCIe flash market. Like sTec in Fibre Channel SSDs, Fusion-io excelled with its development of the PCIe flash card market, outsmarting competitors by moving quickly and decisively to increase capacity and performance, and effectively monopolising the enterprise server application acceleration space. A new CEO, Shane Robison, came on the scene in May. Co-founders David Flynn and Rick White, CEO and chief marketing officer respectively, resigned from their exec positions and then from the board. Part of the reasons given at the time was that Fusion-io needed more operational excellence, which the latest quarterly results disappointingly fail to demonstrate. 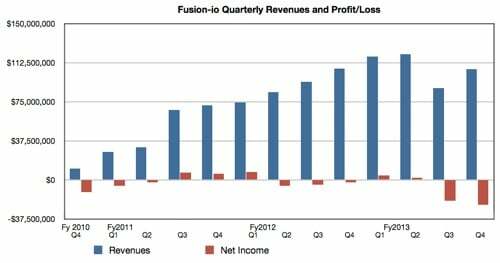 To the numbers; revenues for the final quarter of Fusion-io's fiscal 2013 were $106.1m, essentially the same as the year-ago quarter's $106.1m – and they were 21 per cent higher, satisfyingly, than the previous quarter. The good news stops there, as net income, despite the revenue rise, tumbled to a $23.8m loss, ten times worse than the $2.4m profits recorded a year ago and 19 per cent worse than the previous quarter's $20m loss. Full year revenues were $432.4m, 20 per cent higher than 2012's $359.3m. But the net loss for the year of $38.2m was 6.3 times bigger than the previous year. It seems righting the previous management's mistakes is taking longer than expected. What went wrong? Apple didn't buy as much kit as hoped, which contributed to the reduced revenues. Sales and marketing headcount went up as Robison and his team started correcting what they called “go-to-market problems”, which increased Fusion-io's costs. In the earnings call they identified OEM channel conflict as a problem area. With, for example, the low-cost high-capacity ioScale PCIe flash card product, OEMs were qualifying it when Fusion-io announced it as a product it would sell to hyperscale data centre customers. The OEMs were miffed. There was also inadequate pricing clarity and price positioning between Fusion-io products it sold and similar products supplied to its OEMs. Similarly the Nexgen acquisition in April equipped Fusion-io to sell hybrid flash/disk drive arrays, like its OEMs. Was Fusion-io a supplier to its OEMs or a competitor? It couldn't be both. Robison recognised this: "There's been a lot of question about channel conflict with our enterprise customers, and we're determined to eliminate that. So as we go into the second half of this year, we'll rebuild our OEM relationships." Fusion-io's go-to-market strategy identifies three target markets: hyperscale data centres, enterprises and small/medium business. Working better with OEMs and ISVs is seen as critical. Revealingly, he said: "We will accelerate our ioScale qualification with our OEM partners. Given our speed of innovation, it is important that we carefully coordinate with our partners when we bring new products to market." Translation: it hasn't done this well enough in the past, particularly with ioScale technology.